The Tot Tutors Kids Wood Table and 4 Chairs Set is the perfect size for children to eat, read books, color, do arts and crafts, play board games, and just have fun. 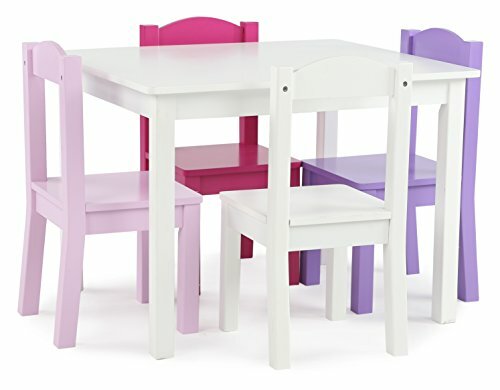 The table and chair set is ideal for your toddler's bedroom, playroom, or the living room. This piece of furniture is easy to assemble and the sturdy table and chairs are great for boys and girls ages 3 years and up. Construction on this engineered wood table and chair set offers solid support and long-lasting durability. The height of this furniture is just right for toddlers and preschool-aged children. Giving your little one a table and chair set at their size gives them a sense of control and helps them learn independence. This kids table and chairs set comes in multiple color options to complement the existing furniture in your home as well as the toy storage organizer products in Tot Tutors' line of kids furniture. Color options include Primary Collection: natural table with primary chairs (red, green, blue, yellow); Summit Collection: White table and chairs; Pastel Collection: white table with pastel chairs (pink, light green, baby blue, light yellow); Friends Collection: White table with pink and purple chairs (pink, purple, dark pink, white); Espresso Collection: espresso table and chairs. Product sizing – Table: 26”W x 22”D x 19”H Chairs: 10”W x 10”D x 22”H Seat height: 10”H Tot Tutors offers a full line of children's furniture, organizational basics, and storage solutions. We have multiple room collections that fit the style of any home. Our children's table and chairs, toy storage organizers, toy boxes, bookcases, beds, and upholstered chairs blend with all of your home's furniture. Whether it's the living room, playroom, or your child's bedroom, Tot Tutors has just the right product to help your family grow. If you have any questions about this product by Tot Tutors, contact us by completing and submitting the form below. If you are looking for a specif part number, please include it with your message.